We get it. Not everyone loves to run. Common complaints: It hurts my knees, it’s boring, I’ve stopped seeing results. 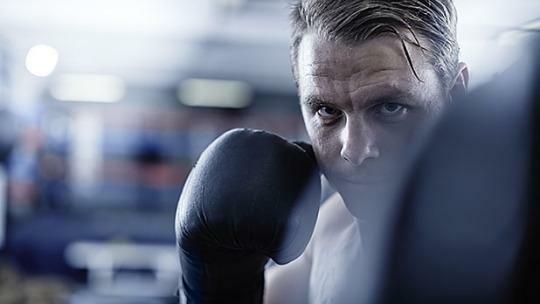 Thankfully, there are plenty of other ways to get a heart-pumping, calorie-crunching workout. In fact, by upping the intensity and speed of your exercise routine, you can turn almost any workout into a cardio workout, says Brian Gallagher, co-owner of Throwback Fitness. Here are 10 ways. Old school moves meet forward-thinking exercise routines at Throwback Fitness in New York City. With interval workouts, you can reap even more cardio benefits than you would on a treadmill, says co-owner Ryan Wilke. Try repeating this short circuit of bodyweight exercises — completing as many rounds as you can in four minutes — followed by jumping rope as many times as possible in one minute. Repeat for a total of five circuits. 10 squats: Stand with feet hip-width apart and squat down as low as you can, keeping shoulders up and back flat. Press through heels to stand. 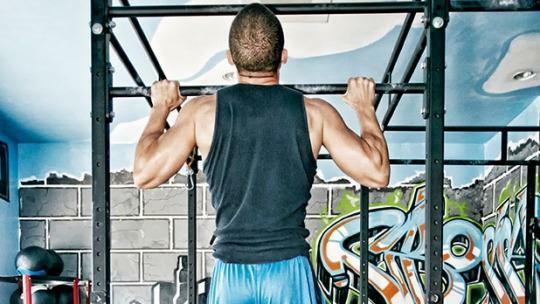 10 pull-ups: Start from a dead hang and pull yourself fully up to the bar, so it’s level with your collarbone. 10 push-ups: Keep the elbows snug to the body as you lower your chest to the ground and then raise back up. 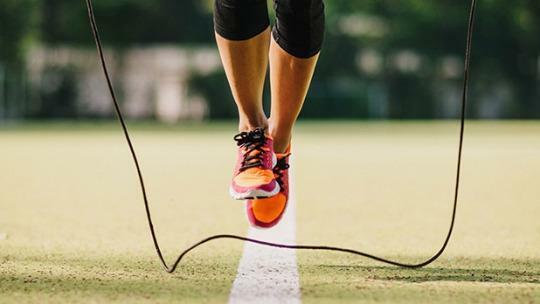 After completing as many rounds of squats, pull-ups, and push-ups as possible in four minutes, jump rope for one minute, then complete the circuit four more times. The next time you find yourself at the ocean, head to the nearest net. “Moving around quickly on sand takes a lot more energy than moving fast on something hard like cement,” says Scott Herman, a trainer with the BeFit Network. 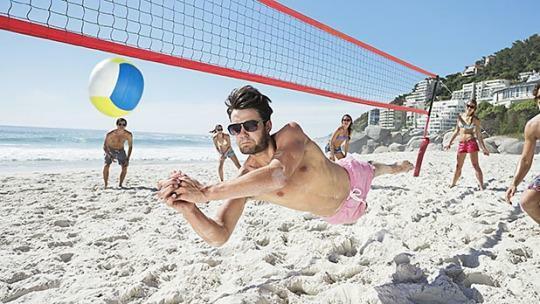 “The sand shifts under your feet, which means you’re constantly correcting yourself and having to generate a ton of power, especially when jumping high.” The unstable sand is also great for strengthening legs and ankles, which tend to weaken as you get older. Plus, unlike a grueling 45 minutes of running on a treadmill, volleyball is usually done with friends, so you can go for hours without noticing it. 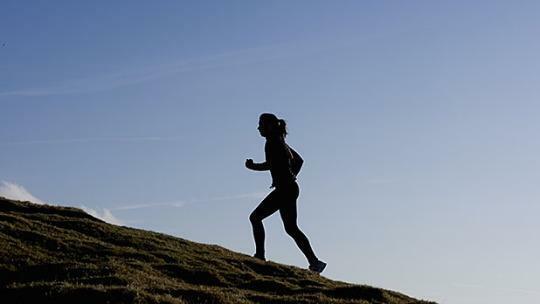 If you love the long and isolated nature of running, hop on two wheels instead. 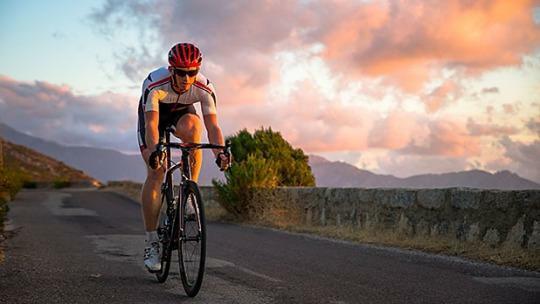 “Cycling is great because you can change your intensity depending on the terrain you choose,” says Herman. “You can go mountain biking, which is more intense and requires bursts or speed, or road cycling, which tends to be more endurance based.” If you do go out, make sure you use clip-ons so you work your hamstrings as much as your quads. And plan your route ahead of time. That way if you’ll know when a downhill is coming up and push yourself as hard as you can leading up to it. The whole point of high intensity interval training is to push yourself so hard that your heart rate goes sky high instantly. 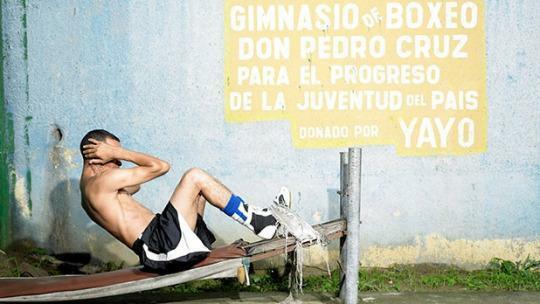 Just try a few tabata rounds and see if you don’t notice a faster pulse. “With tabata, you go at maximum effort for 20 seconds, rest for 10 seconds, and do eight cycles,” says Iwaniuk. “The key is pushing yourself hard in those 20 seconds. If you’re willing to put yourself through the ringer, your heart is going to be pumping a ton of blood through it and you’ll stay in the zone of an elevated heart rate the whole time, even during the rests.” A good goal: Try not to slack off as the rounds go on — if you did 18 air squats in round one, get 18 in round eight. “You end up using every bit of energy you have to get from point A to point B when you’re swimming,” says Herman. “You also kind of trick your brain because you’re tiring out your body, but the water makes it tough to feel sweaty. Plus the pool keeps your core temperature down, which means you might be able to last longer.” His suggestion is to alternate laps of easy paces and sprint paces to get your heart rate up while allowing you to stick it out in the pool. Pump the treadmill up as high as it can go — some get all the way to 30 degrees — and start walking on it to get your heart rate soaring instantly. 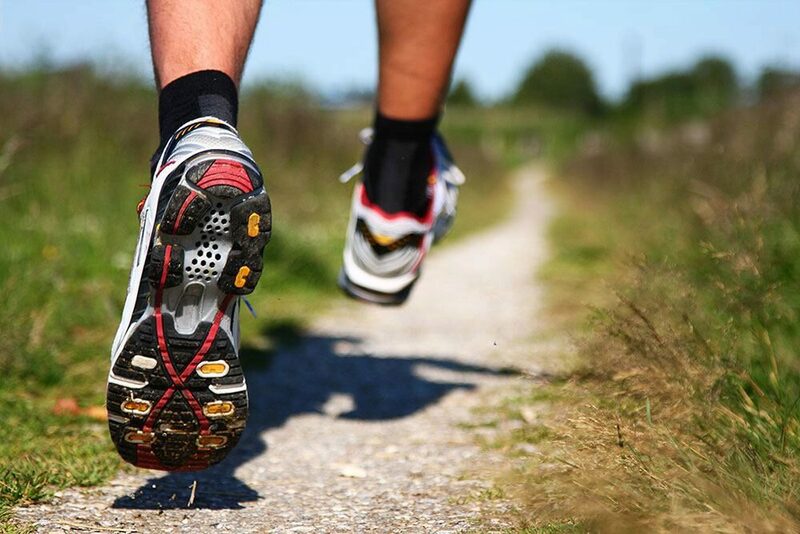 “It pushes your legs and lungs without the pounding of running,” says Corkill. “That means this is a great form of cardio if you need to save your knees or hips.” Don’t hold on to the side bars and when you start to get tired, make sure you don’t slouch over. Start out at a 3.2 to 4.0 speed, which will be plenty, and see if you can make it 15 minutes. This routine from Wilke and Gallagher combines jump rope, dumbbells, and bodyweight exercises. Perform five rounds, trying to beat your best time. 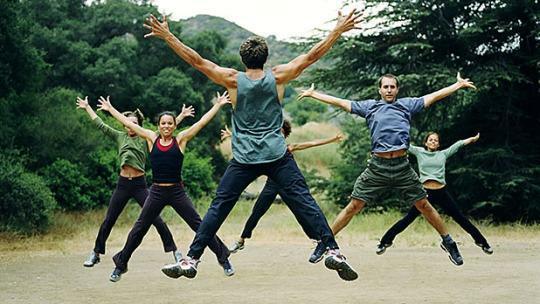 If you stop or catch your feet while jumping rope, you must complete three burpees before resuming the workout. 10 dumbbell push presses: With the dumbbells in front of your shoulders, bend at the knee by a few degrees to drop your hips straight down. In one strong motion, extend the knees and hips and let the momentum travel into the dumbbells to press them overhead. 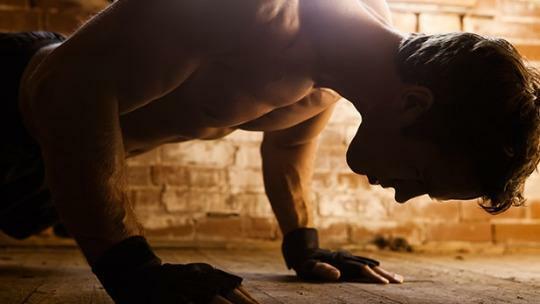 20 push-ups: Keep the elbows snug to the body as you lower your chest to the ground and then raise back up. 30 crunches: Laying on your back, curl your trunk so you’re raising your shoulder blades off the ground. 40 lunges: Keep your front knee over your ankle and tap back knee to the ground, practicing balance and control throughout the movement. 50 unbroken jump rope turns. 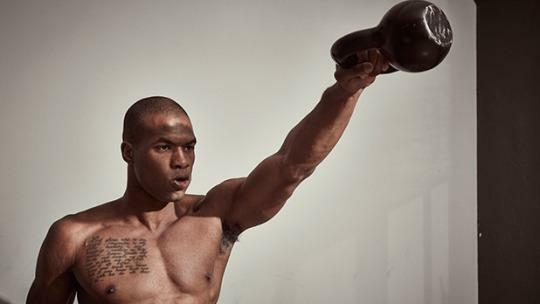 Want a bigger challenge than dumbbells or kettlebells? Wilke and Gallagher of Throwback Fitness change up their routines by incorporating medicine balls into their workouts. Try completing 10 rounds of the following circuit as fast as possible. 10 overhead lunges: Hold the med ball overhead. Perform five reps on each leg. 15 thrusters: Holding a med ball at the top of your chest, drop down into a squat, then explode upwards, pushing the ball toward the ceiling. 20 medicine ball sit-ups: Hold the ball against your chest for the sit-up. Renegade rows: Grab a pair of dumbbells and start in a plank position with both hands gripping the weights. Your body should form a straight line from your head to your heels and your feet should be a little more than shoulder-width apart. Keeping your hips still, pull your right elbow up into a row, then return the dumbbell to the floor. 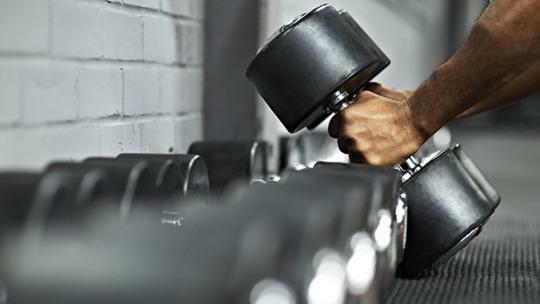 Repeat this movement with your left arm for one rep.
Thrusters: Holding a pair of weights at your shoulders, drop down into a squat, then push through your heels to explode upward, pushing the dumbbells toward the ceiling. Weighted lunges: Keep your front knee over your ankle and tap back knee to the ground. Hold the dumbbells by your waist, or for added difficulty, overhead. Weighted sit-ups: hold one dumbbell by both ends, across your chest. For added difficulty, press the dumbbell over your head at the top of the sit-up. Who needs a treadmill? With this workout, from Wilke and Gallagher, all you need is your body, a little floor space, a towel to mop up with. The key: Don’t take a break. Go as hard as you can in 15 minutes, completing the maximum rounds possible. 15 push-ups: Keep the elbows snug to the body as you lower your chest to the ground and then raise back up. 15 squats: Stand with feet hip-width apart, and squat down as low as you can, keeping shoulders up and back flat. Press through heels to stand. 15 cross-body mountain climbers: Start in a plank position, keeping your body in line from your head to your toes. Then, lift your right leg off the ground and pull your knee toward your left elbow. Return to the stating position and repeat on your left side for one rep.
15 flutterkicks: Lie face-up on the ground with your hands resting under your glutes. Keeping your body flat and your abs braced, raise your feet a few inches on the ground and kick up and down with both feet, as if you were swimming in a pool. Kettlebell workouts are a mix of strength training and cardio, says Tina Tang, a StrongFirst-certified kettlebell instructor and personal trainer. “It takes a lot of effort to perform weighted lifts, and by doing the exercises without stopping, you’ll also crank up your heart rate.” Tang recommends starting with a kettlebell that weighs 35 to 44 pounds (16 to 20kg). Complete as many rounds as possible within 15 minutes. 10 kettlebell swings: Start in a deadlift position, grasping the handle with both hands. Then, thrust your hips forward, letting the kettlebell extend naturally until it’s in front of your chest. Keep your elbows locked through the movement and lower the weight back to the starting position. 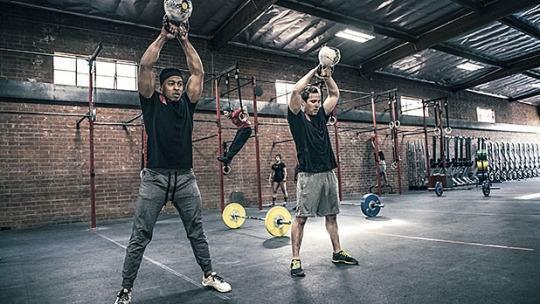 If you’re already comfortable with kettlebell swings, extend the swing to overhead. 10 kettlebell squats: Grip the handle of the kettlebell with both hands, holding the weight to your chest. Keeping your feet slightly wider than shoulder-width part and your back straight, drop down as low as possible, then push up through your heels to the starting position. 10 kettlebell overhead press: Hold a kettlebell in your right hand, with the weight resting on the back of your wrist, tucked in front of your shoulder. Extend your arm toward the ceiling, pushing the weight over your head. Return to the starting position. Perform five reps with each arm. Warm Up: Start with a five-minute light row at 20–22 strokes per minute. Row hard, but not all out, for 30 seconds, maintaining a stroke rate of 24 strokes per minute. You’ll be raising and lower your pace over seven segments, and the pyramid looks like: 24-26-28-30-28-26-24. After 30 seconds, increase the stroke rating to 26 strokes per minute while maintaining the same power output (watts) per stroke. Hold the pace for 30 seconds. Your average split should drop at least five seconds with each jump in pace. Continue raising the pace by two strokes per minute every 30 seconds until you hit 30. 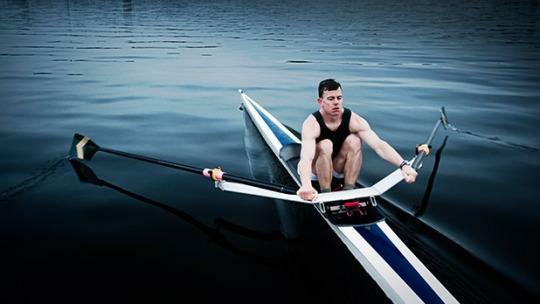 After rowing at 30 strokes per minute, bring the stroke rating back down to 28 per minute for 30 seconds. Be careful not to increase your split time as you slow down the rating. Continue bringing down the rating, every 30 seconds, until you’re back to 24 strokes per minute. After your last 30 seconds, do a one-minute recovery row and repeat the pyramid workout one more time. Afterwards, do a one-minute cool down, then stretch. High-intensity interval training (HIIT) workouts are short in time, but high in intensity. By going all-out and challenging yourself to perform the exercises in the shortest amount of time possible, you’re guaranteed to get your heart rate pumping, says Grigas. Perform each of the movements below using a three-round, 21-15-9 rep count. For example, you’ll do 21 jumping lunges, followed by 21 push-ups, then perform 15 jumping lunges and push-ups, then a round at nine reps. Jumping lunges: From a standing position, jump into a lunge, with your right knee bent at a 90-degree angle. Then, push up through your heel and switch sides in the air, so your left leg is bent at a 90-degree angle. That’s one rep.
Push-ups: Keep the elbows snug to the body as you lower your chest to the ground and then raise back up. Talk to any swimmer, and they’ll insist that their workouts are harder than any other athlete’s. 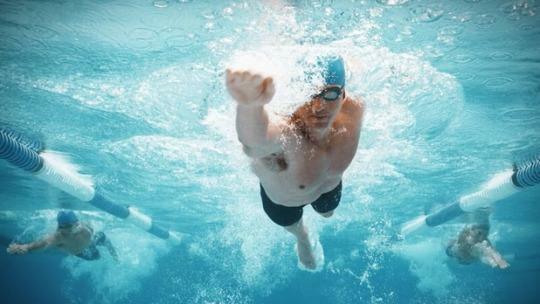 They’re probably right: Swimming laps for just 30 minutes can burn 400 calories. Plus, you’re working just about every muscle in your body, says Jamie Grigas, a coach at EVF Performance in New York City. This workout was designed for a 25-yard pool (each lap is equal to 25 yards). Warm Up: 300 yards freestyle, 100 yards kick (use a kickboard or perform a side kick), 200 yards freestyle, 50 yards kick. 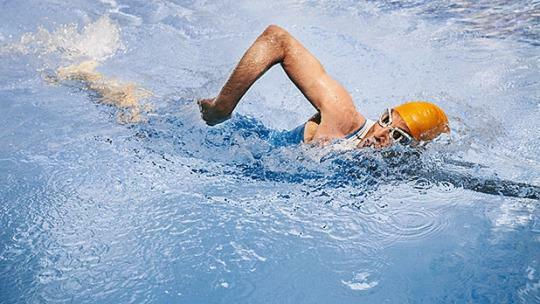 Cool down: Perform a low-intensity backstroke for 100 yards.